CATV technology has matured steadily over the past several years, and has expanded into diverse applications. However, as the quick expansion in technology and services, it’s important to improve CATV network component performance for higher visual and audio signals transmission. Optical amplifier for CATV application is the key element in such transmission. This post intends to give a clear introduction of optical CATV amplifier and its application in CATV transmission. CATV amplifier is also a type of EDFA (Erbium Doped Fiber Amplifier) amplifier which is the most popular optical amplifier in optical network communications. It is mainly used to amplify damped TV signals (compensation for loss) for improved signal quality before sending them to each subscriber. Moreover, CATV amplifiers not only amplify the signal, but also amplify the noise on the line, and bring some return loss. That’s why a quality CATV amplifier price is a little high, because it can provide better performance for the whole network transmission. Why CATV Amplifier Is Needed? As we all know, CATV network is a multi-channel TV system to transmit high quality video and sound signal from a large number of digital or analog broadcast television and radio channel via fiber optic cable or coaxial cable. CATV amplifier often acts as booster optical amplifier in this system to get satisfying transmission effect. The following picture illustrates a basic long haul CATV transmission system using EDFA amplifier. In most cases, the satellite providers deliver high quality digital video and audio to users’ home depending on the users’ equipment. However, the signal incoming cable feed is connected to more than one equipment with use of optical splitters. And if the incoming signal gets fragmented and rerouted, the overall speed and quality will be worse. Under this condition, an optical amplifier can be used to boost the signal power and help users get better services. As have mentioned above, a basic long-haul CATV communication link consists of head end, transmitter, receiver, optical amplifier, and sometimes fiber splitter is also needed in this type of transmission network. The head end receives TV signals off the air or from satellite feeds, and supplies them to the transmission system. The optical splitters are often utilized in a poin-to-multipoint configuration. Here are two CATV fiber network cases using CATV booster amplifier. This is a point-to-multipoint medium size private CATV network. In the head end, the transmitter receives signals from the RF combiner on the 1310nm or 1550nm wavelength. Then the signals split into several parts and are received by the CATV receiver. Finally, all the signals are amplified by the CATV amplifier and sent to the subscriber. In the above application case, the optical amplifier lies behind the CATV receiver, but in this case, it’s a little different. As we can see from the graph, the CATV amplifier lies in the front of the receiver to boost the transmission distance longer. Except for that, this transmission network also deploys two DWDM Mux/Demux to multiply the eight different wavelengths into one fiber for better transmitting. Please note that this graph just illustrates part of the long-haul CATV system. CATV amplifiers are used to boost the quality of optical signals and improve the speed and reliability of the services that users get. FS.COM offers various CATV amplifiers with different values and CATV optical transmitter. All of them are high quality. If you are interested, please contact us via sales@fs.com. Wavelength division multiplexing (WDM) is a commonly used technology in optical communications. It combines multiple wavelengths to transmit signals on a single fiber. To realize this process, CWDM and DWDM mux/demux are the essential part. 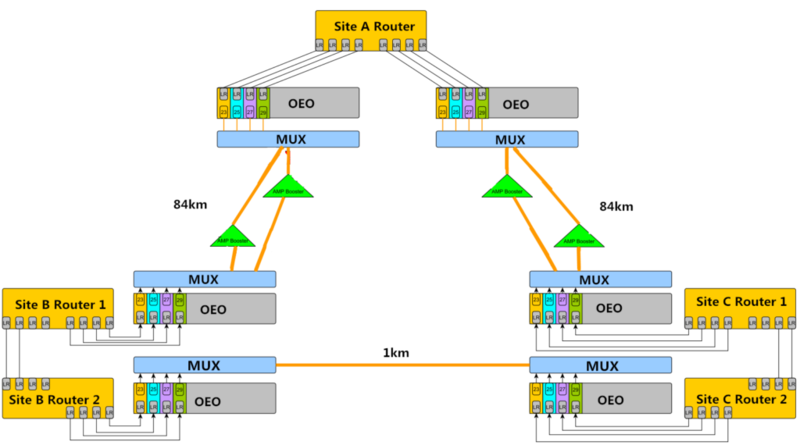 As we all know, there are several different ports on the WDM mux and demux. This article will give a clear explanation to these ports and their applications in WDM network. Line port, sometimes also called as common port, is the one of the must-have ports on CWDM and DWDM Mux/Demux. The outside fibers are connected to the Mux/Demux unit through this port, and they are often marked as Tx and Rx. All the WDM channels are multiplexed and demultiplexed over this port. Like the line port, channel ports are another must-have ports. They transmit and receive signals on specific WDM wavelengths. CWDM Mux/Demux supports up to 18 channels from 1270nm to 1610nm with a channel space of 20nm. While DWDM Mux/Demux uses wavelengths from 1470nm to 1625nm usually with channel space of 0.8nm (100GHz) or 0.4nm (50GHz). Services or circuits can be added in any order to the Mux/Demux unit. Monitor port on CWDM and DWDM Mux/Demux offers a way to test the dB level of the signal without service interruption, which enable users the ability to monitor and troubleshoot networks. If the Mux/Demux is a sing-fiber unit, the monitor port also should be a simplex one, and vice verse. Expansion port on WDM Mux/Demux is used to add or expand more wavelengths or channels to the network. By using this port, network managers can increase the network capacity easily by connecting the expansion port with the line port of another Mux/Demux supporting different wavelengths. However, not every WDM Mux/Demux has an expansion port. 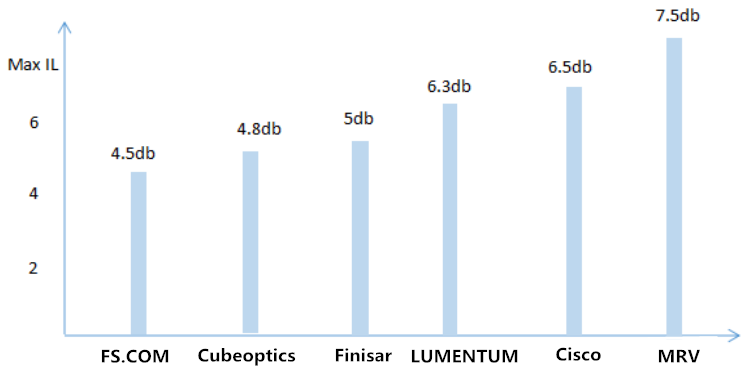 1310nm and 1550nm are one of WDM wavelengths. Many optical transceivers, especially the CWDM and DWDM SFP/SFP+ transceiver, support long runs transmission over these two wavelengths. By connecting with the same wavelength optical transceivers, these two ports can be used to add 1310nm or 1550nm wavelengths into existing WDM networks. 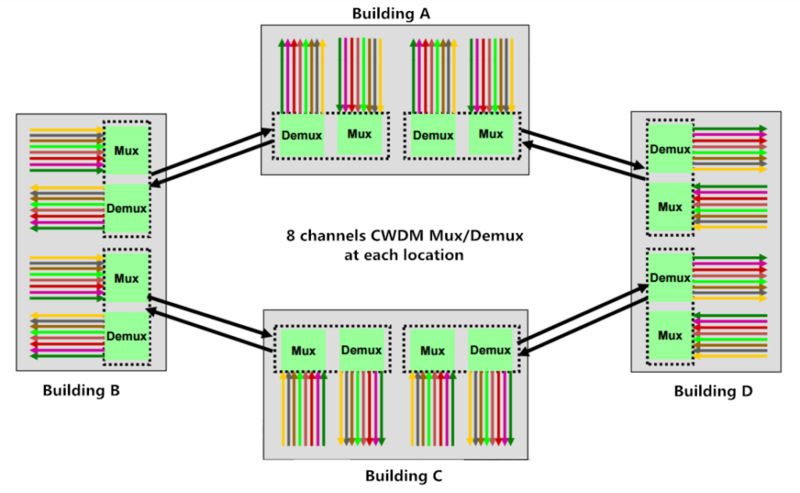 Although there are several different ports on WDM Mux/Demux, not all of them are used at the same time. Here are some examples of these functioning ports in different connections. This example is a typical point-to-point network where two switches/routers are connected over CWDM wavelength 1511nm. The CWDM Mux/Demux used has a monitor port and 1310nm port, but the 1310nm does not put into use. In addition, an optical power meter is used to monitor the power on fibers connecting the site A and B. In this example, two 40 channels DWDM Mux/Demux with monitor port and 1310nm port are used to achieve total 500Gbps services. How to achieve this? First, plug a 1310nm 40G or 100G fiber optical transceiver into the terminal equipment, then use the patch cable to connect it to the existing DWDM network via the 1310nm port on the DWDM Mux/Demux. Since the 1310nm port is combined into a 40 channels DWDM Mux, then this set-up allows the transport of up to 40x10Gbps plus 100Gbpx over one fiber pair, which is total 500Gbps. If use 1550nm port, then the transceiver should be available on the wavelength of 1550nm. The connection in this example is similar to the last one. The difference is that this connection is achieved with expansion port not 1310nm port. On the left side in the cases, a 8 channels CWDM Mux/Demux and a 4 channels CWDM Mux/Demux are stacked via the expansion port on the latter Mux/Demux. And the two 4 channels CWDM Mux/Demux are combined with the line port. If there is a need, more Mux/Demux modules can be added to increase the wavelengths and expand network capacity. Different ports on the CWDM and DWDM Mux/Demux have different functions. Knowing more their function is helpful in WDM network deployment. FS.COM supplies various types of CWDM and DWDM Mux/Demux for your preference. And customer services are also available. If you have any needs, welcome to visit our website www.fs.com. How to Realize Single Fiber Connection in WDM System? As we all know, fiber optical networking has two transmission ways: dual fiber transmission and single fiber transmission. 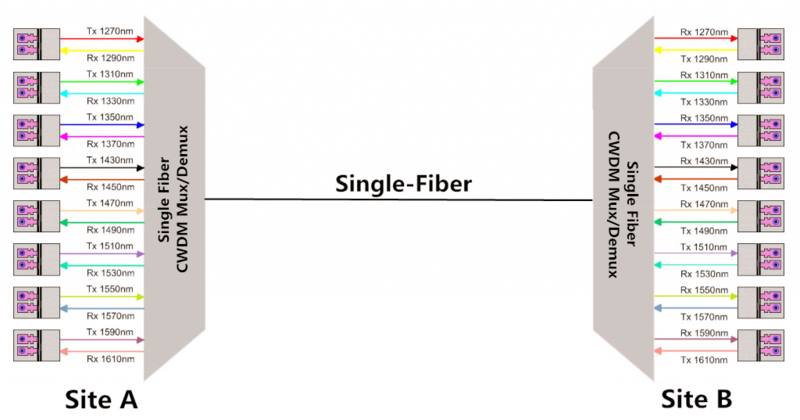 The difference between them is that the former one requires two fibers—one is for transmitting and the other is for receiving, while the latter only uses one fiber for both transmitting and receiving. Single fiber transmission emergence reduces network deployment cost, especially in WDM systems. 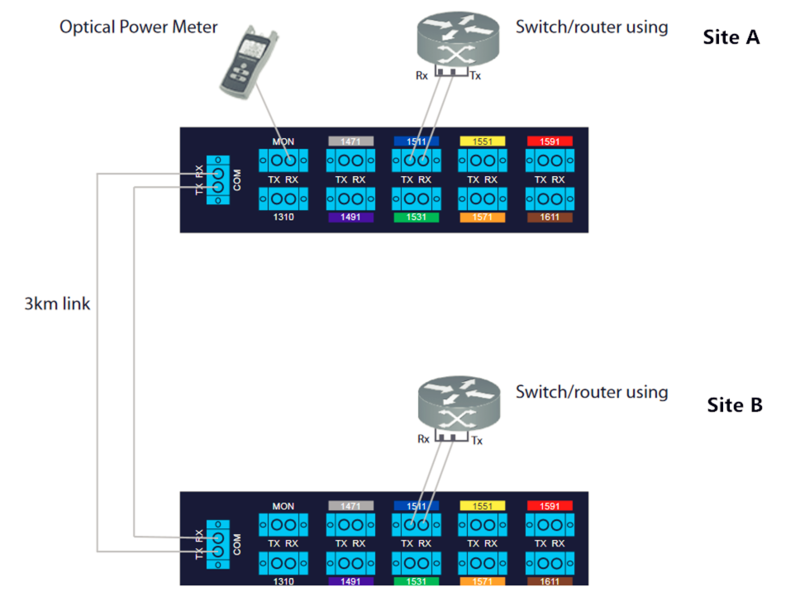 This blog intends to introduce how to achieve single fiber connections in CWDM and DWDM networks. Single fiber transmission, also called bidirectional (BiDi) transmission, sends data in both directions with one strand fiber. For enterprise networks or telecom networks providers who are with limited budgets and fiber capacity, the single fiber transmission is no doubt an ideal choice. In addition, single fiber transmission is popular in many places. CWDM technology enables multiple channels (wavelengths) to be transmitted over the same fiber cabling and is able to provide a capacity boost in metro and access networks. Each channel carries data independently from each other, which allows network providers to transport different data rates and protocols (T1, T3, Ethernet, Serial, etc) for different customers or applications. Then how to achieve single fiber transmission in CWDM networks? Here is an example of single fiber solution in CWDM system. The above picture shows how different CWDM wavelengths are transmitted in a single fiber CWDM link. In this link, two 8CH CWDM Mux/Demuxs are required to transmit sixteen different wavelengths. At site A, there is a single fiber 8CH CWDM Mux/Demux using eight wavelengths for transmitting and the other different eight wavelengths for receiving. At site B, another 8CH single fiber CWDM Mux/Demux is deployed. But the wavelengths for TX and RX are reversed. And one single fiber connects the two CWDM Mux/Demux. Notes: the use of transceivers connected with the CWDM Mux/Demux should be based on the wavelength of the TX side. DWDM is an optical multiplexing technology to increase bandwidth over existing fiber optic networks, especially in long haul transmissions. And it can support more channels and higher traffic services such as 40G, 100G of LAN/WAN. Since the cost of DWDM components is high, the single fiber transmission is necessary. DWDM single fiber transmission can be achieved with the use of single fiber DWDM Mux/Demux. As the following picture shows. The picture shows a single fiber 8CH DWDM Mux/Demux with expansion port used for single fiber transmission. Similar to the single fiber CWDM Mux/Demux above, this DWDM Mux/Demux also uses eight wavelengths for transmitting and another eight wavelengths for receiving. 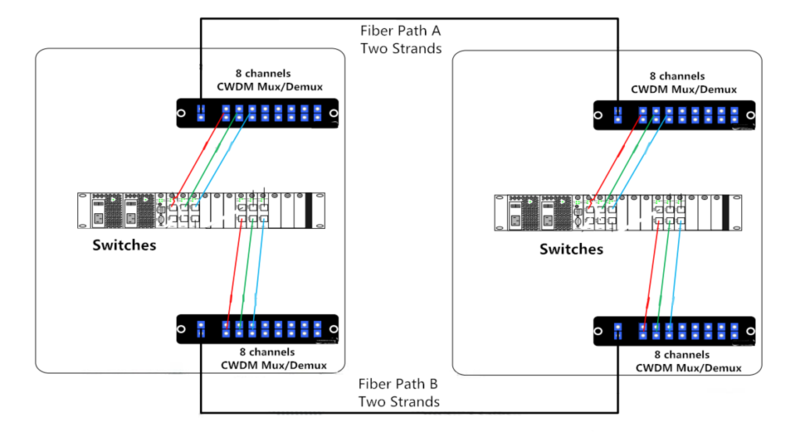 In general, the DWDM Mux/Demux should be used in pairs in single fiber bi-directional transmission, and the Mux/Demux port for specific channel must be reversed. Besides, more channels can be added into the links with the expansion port. This 8CH DWDM Mux/Demux single fiber solution allows extremely high utilizing of a single fiber strand to pass up to 16 wavelengths, optimizing the use of fiber optic cables. And in long distance transmission, optical amplifier also can be utilized. FS.COM supplies various single fiber CWDM & DWDM Mux/Demux and optical transceivers. Here is part of our Mux/Demux products. Anyone who has experiences of deploying WDM networks, either DWDM or CWDM networks, may be familiar with OEO transponder. Since in WDM network deployment, especially for long haul transmission, OEO transponder plays an important role. OEO transponder, also known as WDM transponder, means optical-to-electrical-to-optical. That is to say, it converts an optical signal to an electrical signal, and then recovers it to an optical signal. In some cases, OEO transponder serves as fiber mode converter or repeater for long distance transmission. As we all know, when add a CWDM Mux/Demux or DWDM Mux/Demux into a WDM network, there is a requirement to convert the optical wavelengths like 850nm, 1310nm and 1550nm to CWDM or DWDM wavelengths. Then the OEO transponder comes to assist. The OEO transponder receives, amplifies and re-transmits the signal on a different wavelength without changing the signal content. It’s know to us that multimode fiber optic cables (MMF) are often used in short distance transmission, while single mode fiber optic cables (SMF) are applied in long optical transmission. Therefore, in some network deployment, considering the transmission distances, MMF to SMF or SMF to MMF conversions are needed. In long haul fiber optic transmission, OEO transponder also can work as repeater to extend network distance by converting wavelengths (1310nm to 1550nm) and amplifying optical power. The OEO converter converts the weak optical signals from the fiber into electrical signals, and regenerates or amplifies, then recovers them into strong optical signals for continuous transmission. Having known about the function of OEO transponder, here let me take some application cases as examples to illustrate its applications clearly. The distance between site A and site B is about 165km, and there is a repeater station C. The distance between A and C is 90km. The client needs to build connection between A and B. Just like the following picture shows. In this solution, three OEO transponders are used in this links according to the requirements of the client. The use of the first OEO converter at site A is to convert the signals from MMF to SMF, achieving the long distance transmission between site A and C. The second OEO transponder re-generates and amplifies the optical signal, then convert the it from dual fiber to single fiber. At site B, the OEO transponder re-amplifies the optical signal and recovers it to multimode transmission. Advantages of this solution: use OEO transponder to achieve fiber mode conversion and long distance transmission; make full use of the OEO transponder (retime, regenerate and reshape) to realize high quality connections; save cost by using the OEO transponder. This solution is more complicated than the first one. There are three sites with fiber links between them. The distance between site A and B is 84km, and site B and C is 1km. Site A and C is 84km too. All the 10G connections are dual fiber transmission. Here is a simple picture of this solution. As we can see in the figure, to build DWDM networks between these three sites, six OEO transponders are deployed. Each site uses two OEO transponders. The OEO transponder at site A converts the 10G-LR signals into 10G DWDM wavelengths, then the wavelengths are multiplexed by the DWDM Mux. At site B, the separated wavelengths are recovered to 10G-LR signals through the OEO transponder. The transmission between site B and C, site A and C are similar to the transmission between site A and B. In addition, there are two EDFAs in each two long distance transmissions. Advantages of this solution: using OEO transponder for wavelength conversion. Converting common 10G signals into DWDM wavelengths and transmitting them with DWDM MUX/DEMUX increase the network capacity easily. At the same time, it also reduces the damage of optical transceivers. OEO transponder is an important components in optical networks. This post gives a simple analysis of OEO transponder application case. Hope it’s useful for you. FS.COM supplies high quality 10G OEO converters like SFP+ to SPF+ and XFP to XFP, and 40G WDM transponder like QSFP+ to QSFP+. If you want to know more detailed information, please contact us via sales@fs.com.